Brunch. Something I never truly understood the awesomeness of until I moved to Chicago. We take our brunch pretty seriously here, which is a-OK with me as it’s the only meal where it’s acceptable to have something sweet, something savory, something caffeinated and something alcoholic all in the same meal. If you don’t like brunch, well…um…there’s something wrong with you. The only downfall of living in a brunch-crazed city is the crowds. More often than not you have to wait for a table, which is absolutely the case at M.Henry, one of my favorite brunch spots. This cozy restaurant on Chicago’s northside serves up some amazing items, including one of my all-time favorites — Mango Blisscakes. Only available on Sunday’s, the Mango Blisscakes are just what they sound like — a stack of the fluffiest buttermilk pancakes you’ve ever tried, topped with fresh mango, creamy vanilla mascarpone cream and a brown sugar oat crust. Pure heaven. I love them so much that I was inspired to recreate them myself so I could share the love with you. I hope you enjoy them as much as I do. Now, let’s raise a mimosa to brunch, shall we? The best meal of the week. Preheat your non-stick griddle/skillet over medium-high heat. Meanwhile, whisk together flour, baking powder, baking soda, salt, and sugar in a medium bowl. 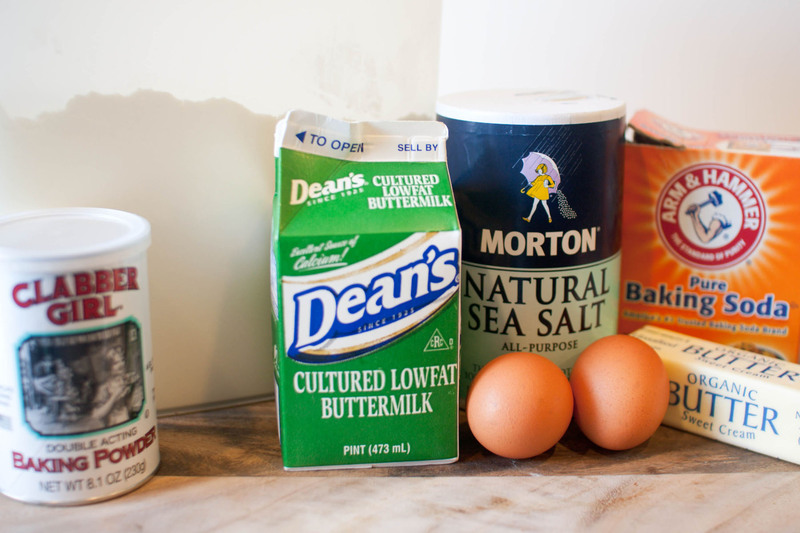 Add eggs, buttermilk, and melted butter; whisk to combine. Batter will be slightly lumpy. Test griddle/skillet by sprinkling a few drops of water on it. If water bounces and spatters off griddle/skillet, it’s ready. 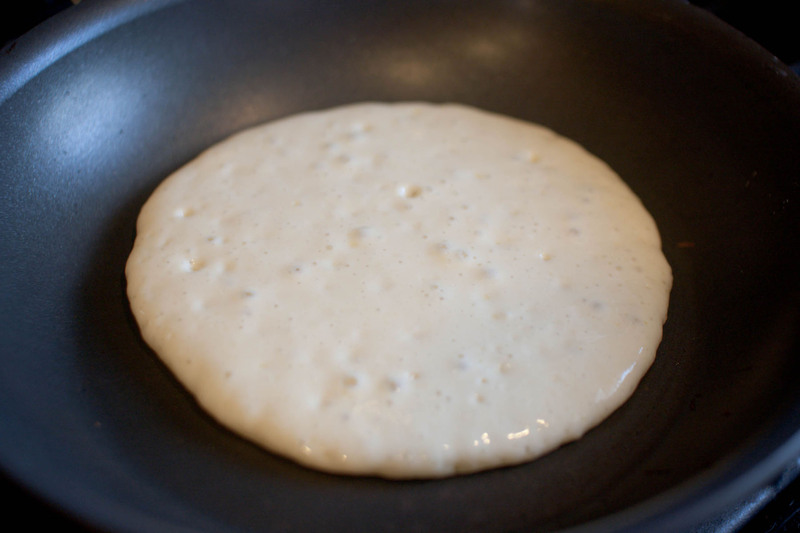 Using a 4-ounce ladle or a 1/2 cup measuring cup, pour pancake batter onto your preheated griddle/skillet. The pancakes are ready to flip when bubbles form in the center and the edges become slightly dry; about 2 minutes. Flip and cook for and additional minute or so. Meanwhile, whip mascarpone and powdered sugar with an electric mixer until light and airy. 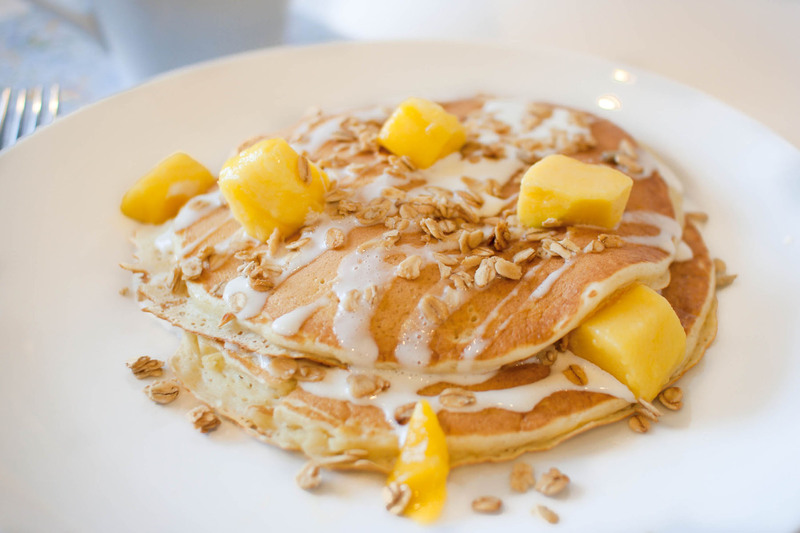 To serve, layer pancakes with sweetened mascarpone, diced mango and a sprinkling of granola. Top with additional maple syrup, if desired. I can neither confirm nor deny that I have thoroughly enjoyed ‘late breakfast’ at several establishments over the past few weeks. I need to try these pancakes though, ‘a big fan of the cornmeal and banana ones I make but this sauce and the mango look excellent. Wow! Never had mango toppings on a pancake before. I will definitely try it because it looks really yummy. Thanks for the sharing the post. Simply delicious!!! Wow, I’m craving these, and with a lovely package of mangos on my counter these just may be on our table this weekend!!! Lovely! I am a definite fan of mango and brunch! I love M.Henry’s – great great Sunday spot! I can’t believe you recreated these… they are soooo good! Thanks for sharing…I am going to give these a go as soon as I find me some mango! I love the idea of mascarpone sauce! And mango too – these look great! I love your description of the components of ‘Brunch’ and I would be very happy to include mango blisscakes in any future brunch. These look light as a cloud and the perfect accompaniment to a mimosa – cheers! bliss is right! looks just fluffy, soft and delicious. I’ll take mango and fluffy pancakes ANYDAY! YUM! Oh does this sound good! I love pancakes and I love mangos. Gotta give this a try. i LOVE everything mangoes. these mango pancakes look amazing!